Todd Minikus and Pavarotti tied with Cara Raether and Ublesco for the first place prize in the $55,000 Mary Rena Murphy Grand Prix at the Kentucky Spring Classic. Photo By: Lindsay Y McCall/PMG. 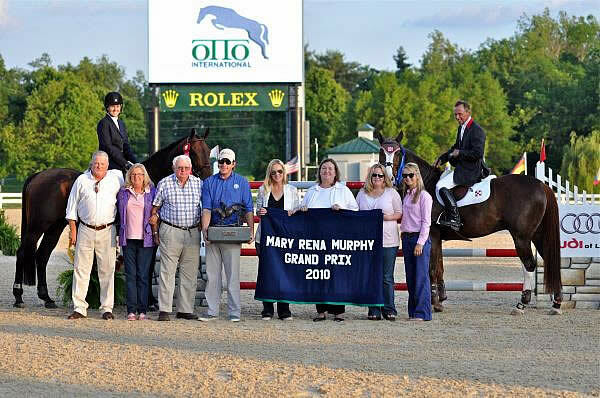 Lexington, KY – May 22, 2010 – Tonight’s amazing finish in the $55,000 Mary Rena Murphy Grand Prix, sponsored by Audi of Lexington, will go down in history. The crowd went wild when Todd Minikus and Pavarotti crossed the finish line in an exciting 35.24 seconds to take over the lead during the jump-off, but when Cara Rather and Ublesco managed to stop the timers at the same 35.24 seconds the night became historical. The fantastic grand prix at the Kentucky Spring Classic was held in the Main Stadium, site of the show jumping events for the 2010 Alltech FEI World Equestrian Games, with the course designed by Conrad Homfeld. The first round had 16 jumping efforts that included a liverpool, a double combination, and a triple combination. Ten riders were able to complete the first round without fault and advance to jump-off. The short course began over a single vertical and a made a sharp right turn to a single oxer before making a left turn to the oxer-vertical double combination. Riders then made a made dash to a single vertical, which they had to slice before continuing to a single oxer. Finally they made a full circle to a single vertical before galloping home over a large oxer towards the gate. Pablo Barrios has been the master of speed during the Kentucky Spring Horse Shows, so when he rode G & C Quick Star, owned by G & C Farm, Gustavo & Carolina Mirabal, into the ring the riders knew he would post the time to catch. He took a sharp slice to fence six and galloped over each obstacle with a hasty pace. The pair laid down a clean trip in 36.99 seconds to take an early lead, but the class was not over yet and their effort proved strong enough for fourth place. Alexa Pessoa knew she would have to give it everything she had with Madison when they took to the short course. In an attempt to cover as much ground as possible they raced to the slice at fence six. They were lucky as Pessoa almost had a miss and a rail, but Madison was as agile as ever and left each fence in tact. The duo tripped the timers at 35.90 seconds, but even their effort was later bested and they earned the third place prize. The plan paid off for Raether when she crossed the finish line at 35.24 seconds with Ublesco, tying Minikus’ time to last one-hundredth of a second and earning both riders the first place honors. Both Minikus and Raether are part of the Long List for the United States Equestrian Team during the World Equestrian Games and will be traveling to Europe during the summer as part of the selection process. Raether plans to leave in just ten days and will be showing Ublesco at Falsterboro. This year, Minikus and Pavarotti were able to win two of the five selection trials and also had a good showing at the 2010 FEI World Cup Finals. He feels the pair is on a good path and is well prepared for their trip to Europe. Tomorrow will mark the final day of competition during the Kentucky Spring Classic at the world-class Kentucky Horse Park. Riders will have the opportunity to showcase their horses during the $20,000 Bluegrass Classic, which will get underway at 8 a.m. in the Main Stadium. For more information about the Kentucky Spring Horse Shows please visit www.kentuckyhorseshows.com.